In the Rakhine State, where violence erupted last summer, many IDPs, especially women and children, are suffering due to the lack of adequate health services. Those with injuries from the earlier conflict are now faced with complicated infections and pregnant mothers are extremely vulnerable. With the Rakhine State Hospital a few hours away, medical attention remains out of reach for those that need it. In partnership with Mercy Malaysia, Muslim Aid is contributing towards the construction of a health clinic which will be centrally located in the Dar Paing Camp so others may have also easy access, together with the provision of vital medical equipment and supplies. 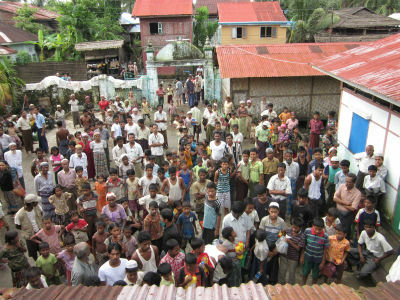 More than 110,000 people are estimated to be living as IDPs in the Rakhine state, after inter-communal violence in June 2012. With little NGO presence in place, they are still in desperate need of food, clothes and basic aid. Please donate now to lend your support.